Former Democratic Rep. John Dingell has died. He served for 59 years in Congress, the longest-serving representative in U.S. history. The man who served in the U.S. Congress longer than anyone else in history has died. John Dingell, a Democrat who represented Michigan in the U.S. House of Representatives starting in 1955 until January 2015, died Thursday at the age of 92, his wife, Rep. Debbie Dingell, confirmed. John Dingell served for 59 years in Congress and cast more than 21,000 roll call votes. He was undefeated in 30 elections. Debbie Dingell wrote, "It is with a heavy heart that we announce the passing of John David Dingell, Jr., former Michigan Congressman and longest-serving member of the United States Congress. Congressman Dingell died peacefully today at his home in Dearborn. "He was a lion of the United States Congress and a loving son, father, husband, grandfather, and friend. He will be remembered for his decades of public service to the people of Southeast Michigan, his razor sharp wit, and a lifetime of dedication to improving the lives of all who walk this earth," she said. "Every now and then, you hear the expression somebody is a 'living legend.' That doesn't even begin to describe John Dingell," then-House Minority Leader Nancy Pelosi, D-Calif., said as Dingell began his retirement in 2015. "When he came to Congress, Americans had Dwight Eisenhower as president, Brooklyn had its champion Dodgers baseball team, and Elvis Presley had his first gold record," said Rep. Steny Hoyer, D-Md., the No. 2 House Democrat. "But what I will point out is what Americans did not have. Americans did not have the Civil Rights Act or the Voting Right Act." Dingell supported both of those landmark pieces of legislation. They were, he said, his most important votes. He also championed the Clean Air and Water acts; Medicaid and Medicare; and like his father, John Dingell Sr., who served before him, he introduced a national health care bill every session until the Affordable Care Act came along. "It meant success. It meant people were no longer going to confront the problems they faced on health care," Dingell said about the ACA just before leaving office. "It was a very humane and necessary thing." One Democrat in Congress opined that Obamacare should be called "Dingellcare." John Dingell's time in the House predated his election. The son of a representative, he was working as a page in the House chamber in 1941 when former President Franklin Delano Roosevelt delivered his famous speech declaring a "day of infamy" following the attack on Pearl Harbor. Decades later, Dingell recalled watching Roosevelt in leg braces, struggling with the effects of polio as he moved to the podium to speak that day. "He actually walked ... and he was supported by 10 pounds of iron — he had these frames that held him," Dingell said. When he turned 18, Dingell enlisted in the armed forces, but he never saw combat. College and law school at Georgetown University followed, with help from the GI Bill. He then worked a stint as a county prosecutor in Detroit. Dingell came to Congress at age 29 after winning a special election in 1955 following his father's death. He rose to the chairmanship of the House Committee on Energy and Commerce, wielding great power and commanding great respect. A fierce advocate for the U.S. automobile industry, Dingell was often at odds with environmentalists, though they also applauded his work on conservation, clean air, water and protecting endangered species. In 2008, when General Motors and Chrysler were seeking a government rescue amid the financial crisis, Dingell fought for a bailout. "I'm here to tell you this is too big a disaster for us to invite. Imagine a nation with double-digit unemployment. That's what we're going to be talking about," Dingell told NPR's Morning Edition. Late in his career, Dingell bemoaned the rise of the Tea Party and the bitter partisanship that he said made compromise so difficult. "I am sad to leave the Congress. I love the Congress. I will observe that my sadness is ameliorated by the poisonous atmosphere that we see in Congress today," he said during a speech at the National Press Club in 2014. When Dingell retired, his wife won election to his seat — meaning southeast Michigan has been represented by a Dingell in Congress continuously since 1933. Debbie Dingell was re-elected to a third term in 2018. Retirement did not mean John Dingell disappeared. He became a regular presence on Twitter, with a feed that weighed in on everything from University of Michigan football to the current political scene. Dingell was playful and pointed into his 90s. In April 2018, during the runup to the midterm elections, he tweeted: "To my Republican friends in Congress: Retirement is a blast. Naps. Snacks. Join me." Retirement is a blast. Naps. Snacks. Join me. The man who served in the U.S. Congress longer than anyone in history has died. John Dingell, who represented Michigan in the U.S. House starting in 1955 and ending in 2014, was also one of the most powerful congressmen ever. Dingell passed away at the age of 92. NPR national political correspondent Don Gonyea reports. DON GONYEA, BYLINE: The numbers alone are jaw-dropping - 59 years in Congress, undefeated in 30 elections, more than 21,000 roll call votes cast. Here's how Nancy Pelosi described John Dingell as he began retirement at the start of 2015. NANCY PELOSI: Every now and then, you hear the expression, somebody is a living legend. That doesn't even begin to describe John Dingell. GONYEA: That same day, Democratic Congressman Steny Hoyer put it this way. STENY HOYER: When he came to Congress, Americans had Dwight Eisenhower as president. Brooklyn had a champion Dodgers baseball team, and Elvis Presley had his first gold record. But what I will point out is what Americans did not have. Americans did not have the Civil Rights Act or the Voting Rights Act. GONYEA: Dingell supported both of those landmark pieces of legislation. They were, he said, his most important votes. He also championed the Clean Air and Water Acts, Medicaid and Medicare. 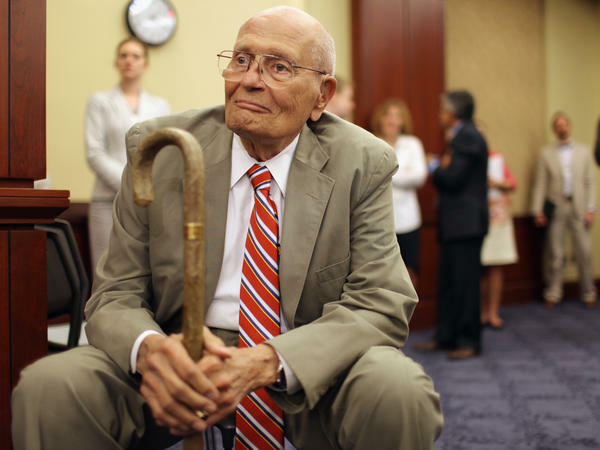 And like his father, John Dingell Senior, who served before him, he introduced a national health care bill every session he served until the Affordable Care Act came along. JOHN DINGELL: I have the curious belief that health care is a right and not a privilege. And I believe that we've waited too long to see to it that that's a reality. GONYEA: One Democrat in Congress opined that Obamacare should really be called Dingellcare (ph). John Dingell's time in the U.S. House actually predated his election. The son of a congressman, he was working as a page in the House chamber in 1941 when President Roosevelt delivered his famous Day of Infamy speech following the attack on Pearl Harbor. Decades later, Dingell recalled watching FDR that day in leg braces, struggling with the effects of polio as the president moved to the podium to speak. DINGELL: So he actually walked, and he was supported by 10 pounds of iron. He had these frames that held him. GONYEA: When he turned 18, Dingell enlisted but never saw combat in World War II. College and law school followed with help from the GI Bill, then a stint as a county prosecutor in Detroit. He came to Congress at age 29, winning a special election in 1955 after his father's death. Dingell rose to the chairmanship of the House Energy and Commerce Committee, wielding great power and commanding great respect. He was a fierce advocate for the U.S. automobile industry. That sometimes put him at odds with environmentalists, though they also applauded his work on conservation, clean air and water and protecting endangered species. Here's Dingell in 2008 when GM and Chrysler were seeking a government rescue amid the financial crisis. DINGELL: I'm here to tell you this is too big a disaster for us to invite. Imagine a nation with double-digit unemployment. That's what we're going to be talking about. GONYEA: Late in his career, John Dingell bemoaned the rise of the Tea Party and the bitter partisanship that he said made compromise so difficult. In the summer of 2014, he spoke at the National Press Club. DINGELL: I am sad to leave the Congress. I love the Congress. I will observe that my sadness is ameliorated by the poisonous atmosphere that we see in American politics today. GONYEA: When John Dingell retired, his wife, Debbie Dingell, won election to his seat, meaning southeast Michigan has been represented by a Dingell in Congress continuously since 1933. With his passing, he leaves a legacy both in terms of legislation and in time of service that may never be equaled. Don Gonyea, NPR News. Transcript provided by NPR, Copyright NPR.